Falling camera: Spinning camera strobes and falls into a pigpen. A few days ago, a very interesting (and very funny) video was posted to YouTube. 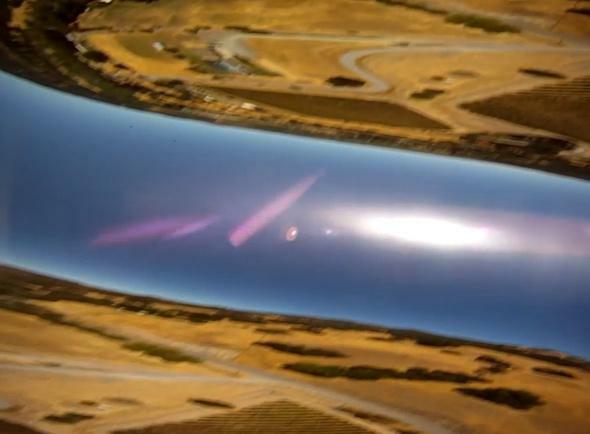 A skydiver’s helmet-mounted camera came loose and fell out of the airplane just before the diver was ready to jump. The camera fell all the way to the ground, survived the impact, and landed in … well, see for yourself. Trust me, it’s worth it. The video quickly went viral, and generally I don’t bother posting stuff like this once it seems like the whole world has seen it (and it does have more than 6 million views as I write this). But a couple of things happened that I think are worth pointing out. One is that a lot of people questioned the veracity of the video. That’s fair, I think. 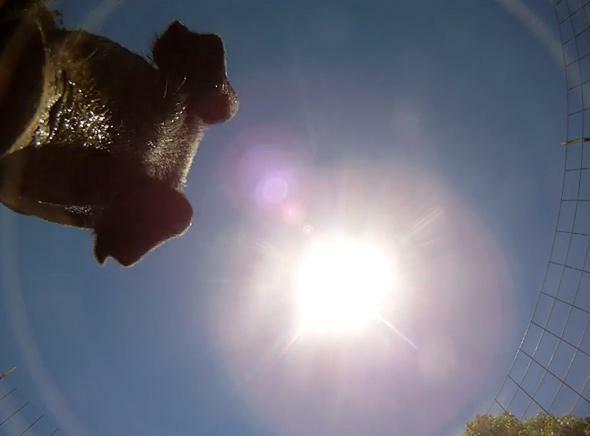 The circumstances of the video are a little suspicious; the camera happens to come loose, happens to survive the fall, happens to land lens side up, happens to have a curious and apparently hungry pig come to investigate immediately. And it’s odd that it took eight months for the farmer to find it and post the video. That’s all pretty weird. That’ll do, Piggly. That’ll do. But also apparently true; Amanda Kooser from CNET investigated, and the story panned out. Truth is stranger than fiction, at least in this case. Mind you, I said it’s fair to question whether the video was real or not, but the howls of “fake!1! !” I saw were off-putting. Better to have an open mind, I think, and look at the evidence first. That’s why I waited to post; I poked around trying to get more data, and happily my friend Bonnie sent me a link to Kooser’s article. I’m satisfied the footage is real, though if someone can come along with better evidence, I’m listening. The camera is a GoPro, built to be tough, and it landed in somewhat soft mud, lessening the impact. The camera also spun madly as it fell, which can also slow the descent speed a bit … and that’s the second thing I wanted to bring up. People have a funny prejudice about cameras, thinking that they work the same way our eyes do. “The camera doesn’t lie,” as the old expression goes. But that’s flat out wrong, plain and simple. Cameras lie all the time. They do not show us what’s really going on in the world, because cameras perforce change the light entering them before making a picture. Digital cameras turn incoming light into electronic signals, stored on little sensitive chips with tiny pixels. They use filters, or can see slightly farther into the infrared than our eyes do, and distort the image a bit. Everything changes when it’s seen through a camera. It’s worse for video, because each frame has to be read out rapidly, each one in the stream stored. That can cause all kinds of weird effects, like freezing motion or making things appear to move backwards (like when it looks like car wheels rotate the wrong way on TV). Trippy freeze frame from the video, showing the landscape below twice due to the spinning and readout rate of the camera lining up. This exact thing happens in the falling camera video. The camera starts to spin as it falls, more and more rapidly. As it does so you can see the landscape and sky dizzyingly whirling. But then a weird thing happens: At about 30 seconds into the video, the picture seems to steady, showing two slightly different angles on the ground. This is more or less what happened in the falling camera but with a twist; it looks like the spin rate didn’t exactly match the readout rate, so you get what’s called aliasing, more than one shot of the ground in each frame. It gets even more complicated because the camera was tilted, and spinning so rapidly that the time it took to read each frame out was distorting the picture. So, for example, the top pixel row of the detector was read out, then the next, then the next, all in a fraction of a second. But during the time between reading out the top row and the bottom row the camera spun a bit, distorting the angles of the picture. This spin rate stays fairly steady until the camera hits the ground. I suspect there’s more going on as well here; the type of detector the camera used (called a CMOS sensor) can actually do image stabilization on the chip itself, as well as other tweaking, so that may also be playing into this. All in all, it goes to show you that a lot of weird stuff can happen that can make you suspicious, and rightly so, but you should wait for evidence (and a cool analysis of the facts) before making up your mind. Also—and stop me if you’ve heard this before—when looking at the world, what you see is most assuredly not what you get. Just click any of the links in Related Posts below for a ton of mind-bending evidence of that.